Scartleads.co.uk bring you all the information you require on scart leads and scart cables. Whether you are looking for a scart to scart lead, scart to component lead, scart to s-video lead or scart to phono lead we have all the information and the best prices in one place. Not only that we bring you information on all other types of home cinema & hifi cables. At the cheap end of the market you will find some very poor quality scart leads, these can usually be indentified by a small diameter cable, plastic shelled connectors and nickel plated contacts. The main problem with this type of lead is the poor screening they offer. Poor screening leads to crosstalk which manifests as a ghosting of the picture. If you are looking for a quality scart lead that is easy on the wallet then check out the range of Prosignal leads available from TVCables. A very reasonably priced lead at around £6 for 1m, the scart leads feature fully screened OFC cable, with all audio and video carry conductors inividually screened. The connectors are die cast metal which provides excellent screening around the connector area. Moving up the market we start to get to the brand named scart cables, Profigold scart leads and IXOS Scart leads. Both IXOS and Profigold produce high quality scart leads and scart cables with features such as multiple screening and Interference Aborbing ferrites. If you have purchased an expensive home cinema or home theatre system it is worth spending that bit extra and buying an IXOS or Profigold scart cable. 1. Choose a scart cable with individually screened audio and video conductors. 2. Cable diameter can be used an indication of screening but be careful, thick PVC jackets can hide what’s really underneath. 3. Scart cables with cast metal connector bodies provide much better screening in the connector area than plastic body scart connectors. 4. Gold plated contacts provide a lower contact resistance. 5. Flat cable scart leads tend to offer higher levels of screening as the conductors are spaced further apart, reducing crosstalk. We get asked many questions about scart leads and scart cables, here are the most popular questions. Click the links to see the full Faq. Can I connect component video to RGB? I have used a scart to component lead but get no picture? Is component video better than RGB? Is s-video better than RGB? Does s-video provide audio and video? Profigold scart leads feature multiple screening, interference absorbing ferrites, OFC cabling, cast metal plugs with gold plated contacts. With many awards to its name the Profigold scart leads represent excellent value for money. Click the following links for the latest pricing. Ixos scart leads provide a number of features such as cast metal plugs with gold plated contacts, RGB wiring for professional performance. Solid metal plugs eliminate EMI and picture shimmer. The IXOS XHT601 range has won awards from at least four mainstream review magazines. Next up from IXOS comes the IXOS XHT801 range featuring black diecast connectors and silver plated cable and twin screen technology, again an award winner. In flat cable IXOS have the IXOS XHT611, again this cable produces the same great performance but uses a stunning looking lilac jacket. Branded cables too much for you? Don’t despair, there are some fantastic cables around that won’t break the bank. Prosignal scart leads provide an economic alternative to the big brand names, so what do you get for the money? Out of the plastic bag the first thing that strikes you about the Prosignal scart cable is the heavy cast metal connector with glistening gold contacts, this feels a quality scart cable from the moment you see it. So looks aren’t everything but this scart cable won’t let you down on performance either, it features individually screened audio and video conductors and OFC cable. Picture performance is clean and crisp, this really is a bargain scart cable, a quality buy at a price that is unbelievable! When we talk about scart leads and scart cables we automatically assume a scart connector on each end, of course there are many other types of scart cable that have different connectors on the other end. Featuring a scart connector one end and 3 phono connectors on the other end, a scart to component lead is commonly used to connect DVD players to high end televsions, plasmas or projectors. Component video leads only carry a video signal. Like component cables scart to s-video cables only carry video although there are alternative cables that carry s-video and audio via an additional two phono connectors. Scart to s-video leads and s-video to scart leads are directional cables, direction is always stated relative to the scart connector, scart to meaning out of scart and to scart meaning into scart. 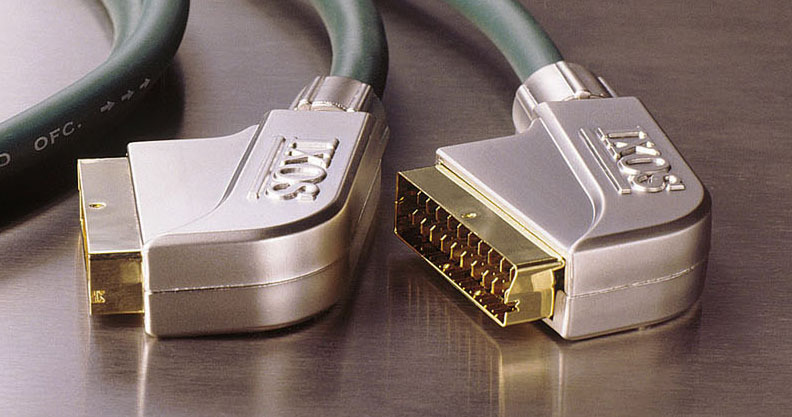 Featuring a scart connector one end and 3 phono connectors on the other end, these leads are used for composite video and left and right audio. Although similar in look to a scart to component cable they are wired differently. Again this is a directional cable which can be in or out of the scart connector. Featuring a scart connector one end and 6 phono connectors on the other, this lead is very similar to the scart to 3x phono lead although it caters for both directions in the same cable. Answer: Not directly, this one of the most common problems that customers encounter with cables like the Profigold PGV372. Although the cable is wired to the RGB pins of the scart connector it would only be suitable for RGB3 sometimes referred to as RGsB which uses a sync on the green signal. Even if you can swicth your television or plasma to sync on green it is unlikely that the source device will output sync on green. Answer: This one of the most common problems that customers encounter with cables like the Profigold PGV372. There are two possibilities, firstly you have connected component video to RGB (see above answer). Secondly you are trying to use a scart to component cable for RGB - Although the cable is wired to the RGB pins of the scart connector it would only be suitable for RGB3 sometimes referred to as RGsB which uses a sync on the green signal. Even if you can swicth your television or plasma to sync on green it is unlikely that the source device will output sync on green. 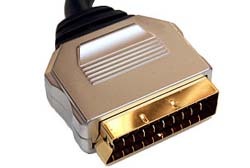 For scart to RGB4 or RGBS we recommend the Profigold PGV7405 and Profigold PGV7410. Answer: Yes and no, RGB has a greater bandwidth is the best video format to use for many devices that support RGB, however DVD video disks are encoded in component video hence it is a better choice for DVD. Answer: No, s-video is not as good as RGB video although it is a very good alternative. The big performance jump is from composite video to s-video and not so much from s-video to RGB.